I happened to be looking back through some old posts on the site and came across one that still haunts me to this day. It was a Tempting Porsches post where I mentioned a 1965 Porsche 912 for sale close by for $4500 (Tempting Porsches #24). Could have been a great find, but I didn’t have the space or real unction to even go look at the car. Man o man do I wish I would have picked that car up. That and probably half a dozen other cars I’ve considered over the years. When I cracked open the copy of Porsche 911 Red Book Motorbooks sent me to review recently, I thought of that ’65 912 all over again. The Porsche 911 Red Book is a handy little guide detailing specification, options, production numbers and data codes, to name a few things, for most of the Porsche 911 series. Years covered include 1964 thru 2014. Pretty much every iteration I could come up with is represented in the book. The layout is very handy, with color coded sections grouping similar years together, for quick reference to the year you’re looking at. A little intro detailing significant changes for the model year range starts each section, along with what each 911 model sold for that year. Everything is covered for the model year including engines, exterior colors, interiors, transmissions, options and even special order items. One of the features I like the most is the chassis and engine serial numbers enabling you to verify a car’s production year, original color, options, etc. It makes a non-Porsche historian like myself confident I can go out and determine on my own, with relative certainty, what I’m looking at. I can imagine this book would come in very handy at auctions, private party sales, swap meets, etc. This book will definitely accompany me on my next Porsche buying outing. 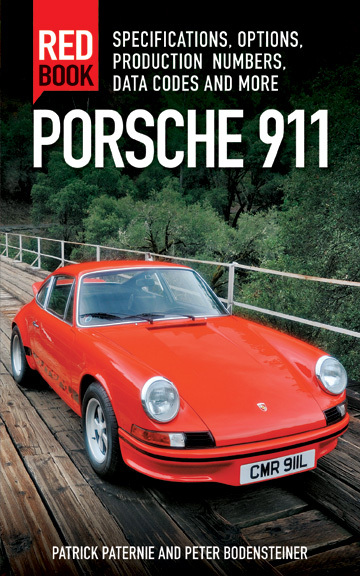 Grab a copy of Porsche 911 Red Book today at Amazon: Porsche 911 Red Book.